Hello again and thanks for checking out our monthly blog collaboration . Celeste and I are happy to welcome Marilyn DeGroot as our guest blogger this month. You can find Marilyn at Mississippi-McGyver. 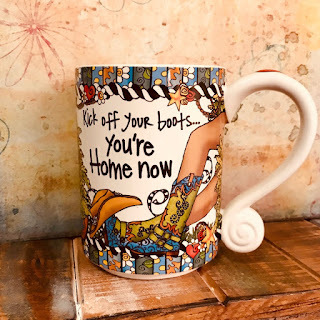 I have known her since 2014 when we were on the Design Team of Mountain Plains Crafters. 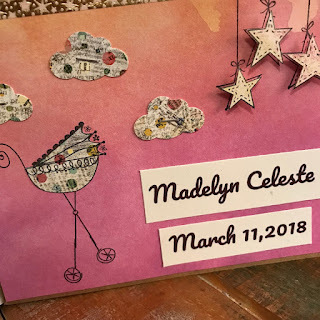 She is an amazing papercrafter and makes the most beautiful projects. I am in awe of her talent !! 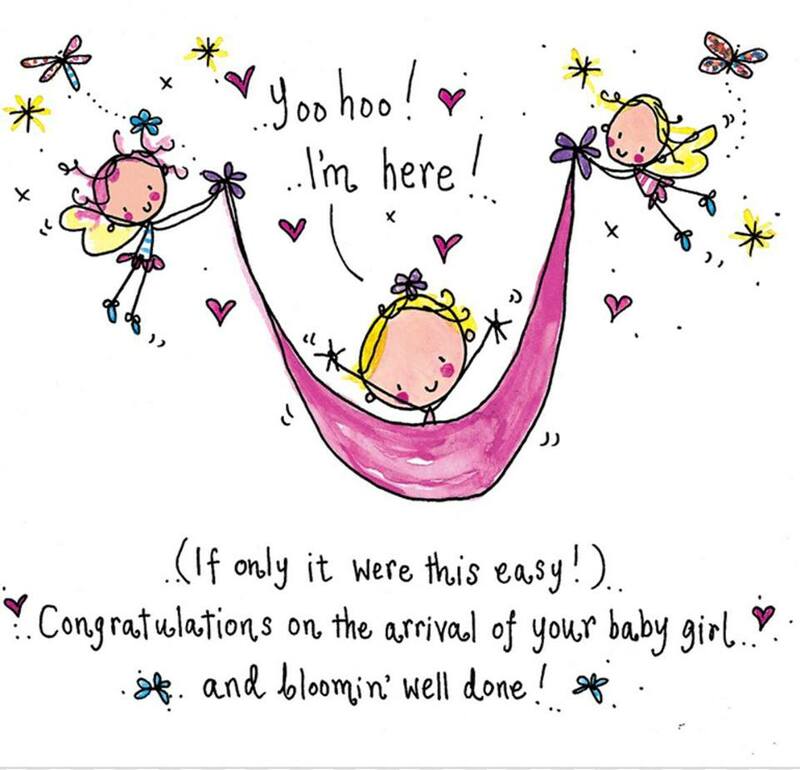 Earlier this month, Celeste was blessed with her second grandchild and that is our theme for this month - babies !! 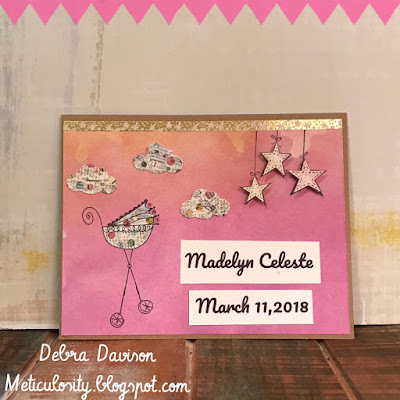 I don't have many baby-themed stamps but I remembered that I had a few from Unity Stamp Company and decided to combine them in this card to celebrate the birth of Madelyn Celeste. I started with a scrap piece of pink paper that also had some yellow highlights. Using Memories India Black Ink, I stamped the Unity Stamp Company image Tickled Pink in the lower right hand corner. The stars are an older Unity stamp "Twinkle Twinkle". I stamped that in the upper right hand corner. The baby carriage was also stamped on a piece of my hoarded Basic Grey paper from the "Out of Print" collection and I fussy-cut the image. I had also stamped the stars on a piece of scrap pale yellow paper and also fussy-cut those. I paper-punched the clouds, also using the "Out of Print" paper and stapled them to the pink background paper with silver staples. A piece of gold star washi was placed along the top edge of the background paper. 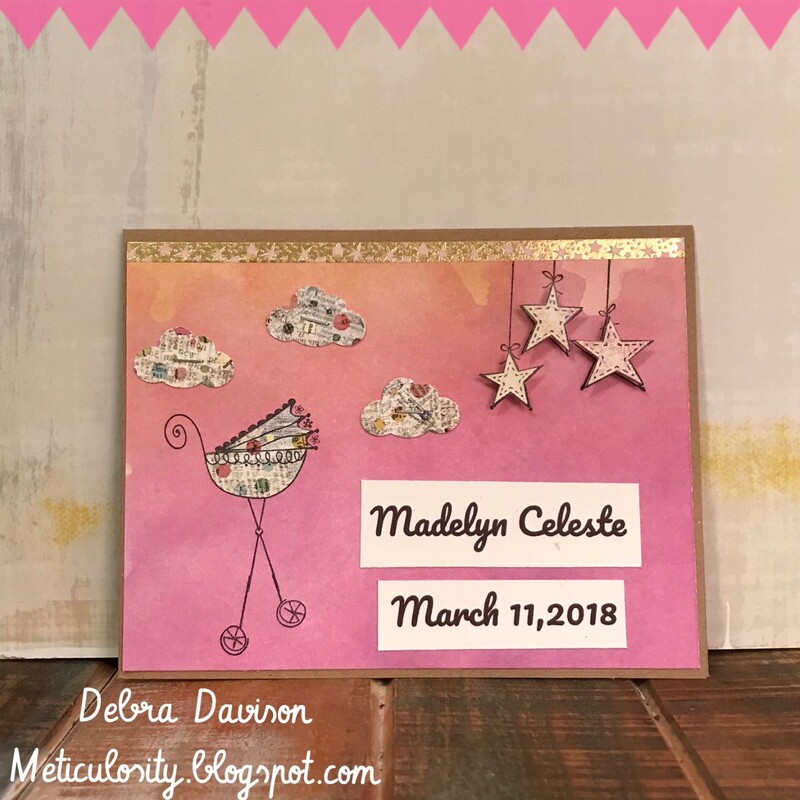 The stars were popped up on top of the stamped image using Tombow Foam Tabs . The carriage was adhered over the stamped image with Tombow MONO Aqua Liquid Glue. 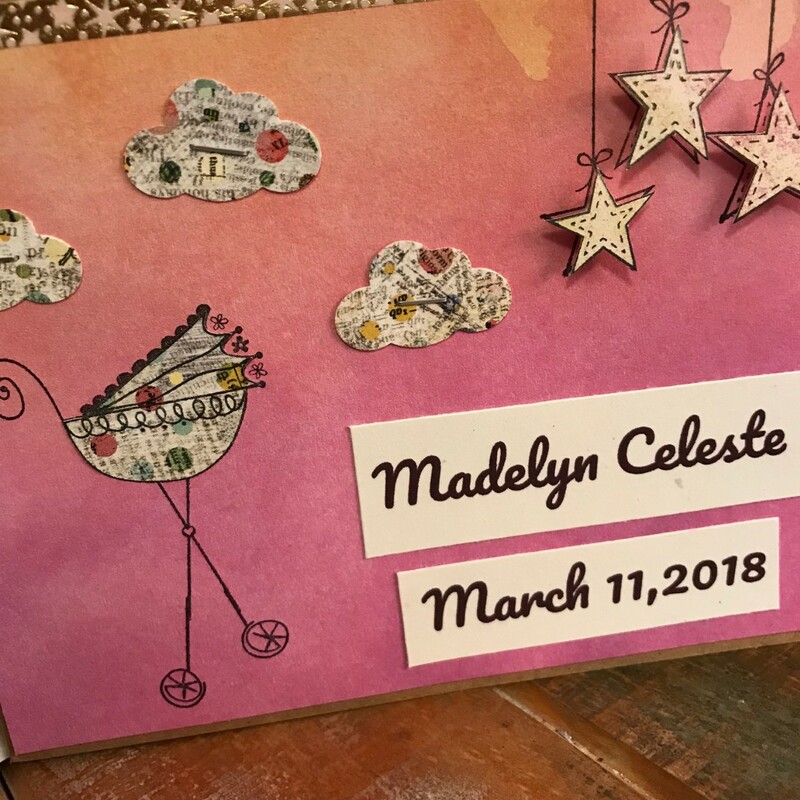 I wrote the baby's name and date of birth using Google Docs,cut them out and adhered them on the lower right side of the card with Tombow MONO Adhesive+ . To finish the card, I adhered the background to a kraft base. I'm so excited to see what Marilyn made and hope you will visit her at Mississippi-McGyver to see her project. Celeste can be found at Crafting Junky . 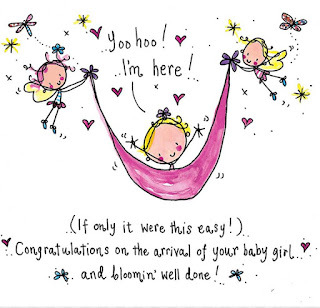 I'm happy to be celebrating the birth of Celeste's son's baby girl. Best wishes to Brian and his wife, Erika. 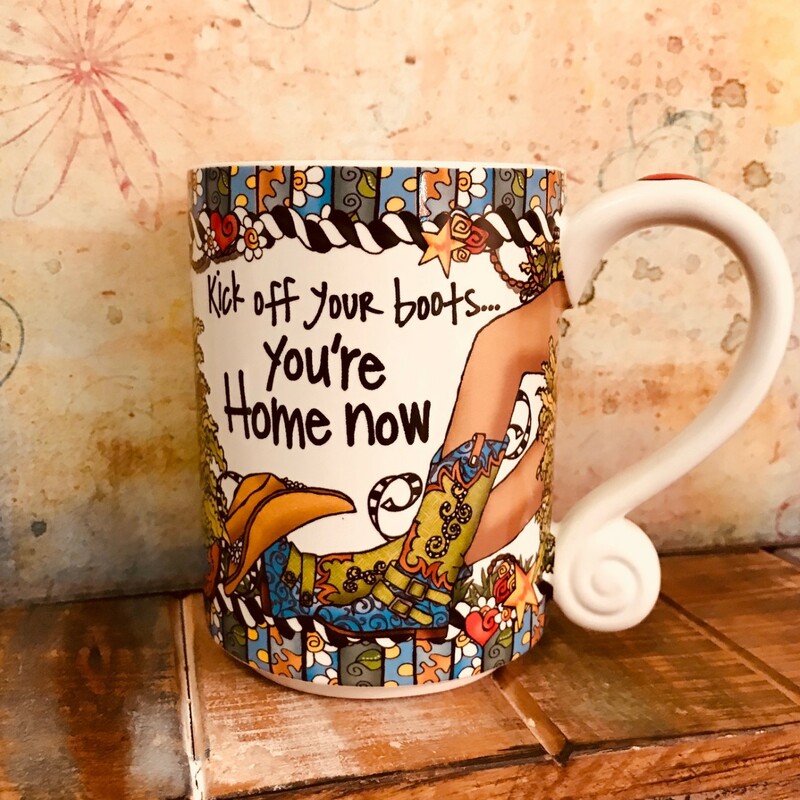 Today, my coffee is Pecan Pie and I'm using a fun mug by Suzy Toronto that I found at Tuesday Morning. It's bright, big and I absolutely LOVE it ! !